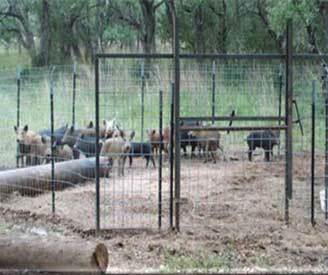 Feral Hogs are domestic hogs that either escape or are released for hunting purposes. Each generation the hog’s domestic characteristics diminish and they develop the traits needed for survival. They are capable of breeding at 6 months of age. They have litters of 10-12 young and can produce 2 litters a year. They have a shoulder height between 35 to 79 inches and weight between 110-200 pounds. Their size greatly varies depending on geography and food supply. States have found that using a public hunting season is not a good way to control populations because it can cause increased release of hogs for hunting purposes. Resource agencies commonly use baiting and trapping and sniper hunting for population control. They are very intelligent and are difficult to catch and control. 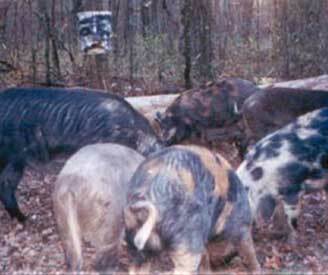 Feral hogs are very adaptable and can thrive in various habitat types. They feed on grasses, forbs, agricultural crops and roots, tubers, and invertebrates. They have also been found to consume the eggs of ground nesting birds. The first wild pigs in the United States originated solely from domestic stock brought to North America by early European explorers and settlers. In the early 1900’s, Eurasian or Russian wild boar were introduced into portions of the United States for hunting purposes. In areas where domestic pigs and Eurasian wild boar were found together in the wild, interbreeding occurred. 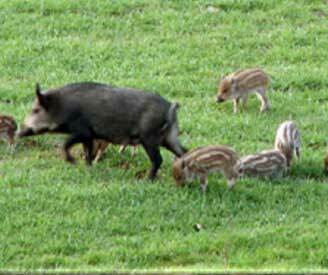 Today, many hybrid populations exist throughout the wild pig’s range. The popularity of wild pigs as a game species has played a major role in the expansion of their range throughout the United States. The sudden presence of wild pigs in new areas is most often a result of: escapes of stocked animals from privately owned, fenced hunting preserves or illegal translocation by humans. They cause destruction of habitat and agriculture commodities. 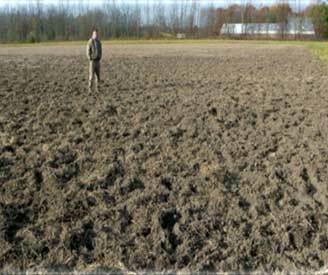 They root and trample to feed which damages agricultural crops and native habitats affecting wildlife. They eat eggs of ground nesting birds.